Erythritol is classified as a zero calorie sweetener and as a low carb sugar alternative. Erythritol technically has 0.2 calories per gram but it has 95% fewer calories than sugar on a weight for weight basis. Erythritol is also 70% as sweet as sugar so you will need to use a little more to achieve the same sweetness as sugar. You may use it as a direct sugar alternative in many recipes including fruit pies, cakes and hard candies. What are the benefits of Erythritol ? Erythritol is a slower burning carbohydrates than sugar. Erythritol's lower glycemic index may be healthier for diabetics and require less of an insulin spike to digest. Erythritol's negligible calories, compared to table sugar, can be beneficial for weight control. Erythritol may promote oral health. Harmful oral bacteria that cause cavities cannot process certain sugar alcohols, like Erythritol, for energy. These bad bacteria typically feed and multiply when they consume sugar, but sugar alcohols can reduce the numbers of the bacteria that causes dental cavities. Erythritol may be heated to high temperatures in baked goods without affecting its sweetening properties, unlike some calorie free sweeteners. Why did you call Erythritol a sugar alcohol? Sugar alcohols, like xylitol and erythritol, may be found naturally in small quantities in produce such as raspberries and they are even produced in small quantities in your own body! Sugar alcohols also find common use as sugar substitutes in a variety of products such as gums, cough drops, toothpastes and jellies and jams among others. Erythritol is made using a mixture of glucose and a specific strain of yeast. There is no difference between erythritol found in nature and the natural erythritol byproduct of the yeast. What is the disadvantage to using Erythritol? Erythritol is generally considered safe for human consumption. Some sugar alcohols can cause intestinal discomfort but this can decrease with continued use. Erythritol has the benefit that it is the least likely sugar alcohol to cause intestinal discomfort because of the way your body processes it. The links are Amazon affiliate links. It does not cost you anything to click on the links to read the reviews on Amazon. 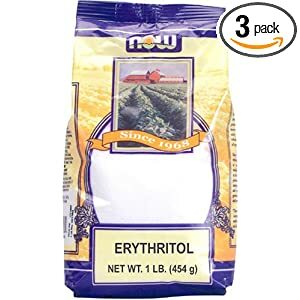 If you decide to purchase erythritol on Amazon there will be no additional cost to you. Also if you found this information helpful please click on the share button to share this content with your friends.